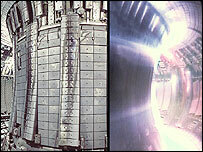 Europe is still confident that it will be chosen to host Iter, the world's biggest nuclear fusion reactor. Philippe Busquin, the EU's research commissioner, told gathered experts the volume of Europe's fusion research would double from 2007 to 2013. Fusion powers stars and is seen as a cleaner approach to energy production than nuclear fission and fossil fuels. Mr Busquin was speaking at a 25th anniversary event at the Jet (Joint European Torus) fusion centre. The Jet project is one of the world's leading fusion research facilities, and holds the record for fusion energy production. 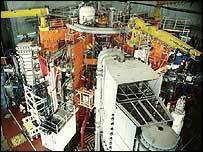 Based at Culham in Oxfordshire, it is a collaboration between all European fusion organisations, and involves technology and physics research from the global scientific and engineering community. Prime Minister Tony Blair sent a message of support for the achievements of the project, which could lead to a substantial reduction in the use of fossil fuels to produce electricity. At the anniversary celebrations, Mr Busquin reaffirmed Jet's position as the main driver in the progress towards eventually producing commercially viable, clean, safe and cheap energy. But the decision on whether the Iter project (International Thermonuclear Experimental Reactor) is built at Rokkasho-mura in Japan, or Cadarache in France, has been delayed several times. Iter would be more than double the size of the facility at Jet, and would aim to generate 500 megawatts of fusion power for 500 seconds or longer. In a special message, Mr Blair said he "hoped to see the siting issue resolved in the next few months". Mr Busquin told BBC News Online that his hope was that the decision would be made quickly, before the end of the summer. Crucial to the decision is the plan for a broader approach to the Iter project and the technological support involved, which includes the location of further research sites and data centres. This includes the location of the International Fusion Material Irradiation Facility (IFMIF), which would help develop materials for fusion production. He also reiterated the importance of gaining full European support for Iter. At a recent European ministerial meeting, the plans to adopt a broader approach to the Iter project were given to ministers. Mr Busquin said that both Japan and Europe had recognised the plans, which would mean that the site not chosen to be the location of Iter would still have a crucial technological role in the project as a whole. Behind the scenes, there has been much political manoeuvring, and the decision is said to be as much about wider geopolitical concerns as technical issues. The European Union, Russia and China want France to win; but South Korea, the United States and Tokyo are backing Japan. In some quarters, it is felt the US objects to the French option because of its position on the war in Iraq. After the International Space Station, Iter would be the largest international research and development collaboration. In terms of the physics and huge amounts of energy involved, the project would be akin to building a star on Earth. It would be the first fusion device to produce thermal energy at the level of conventional electricity-producing power stations, and would pave the way for the first prototype commercial power station. In a fusion reaction, energy is produced when light atoms - the hydrogen isotopes deuterium and tritium - are fused together to form heavier atoms. To use controlled fusion reactions on Earth as an energy source, it is necessary to heat a gas to temperatures exceeding 100 million Celsius - many times hotter than the centre of the Sun. The technical requirements to do this, which Jet has been working on for more than two decades, are immense. But the rewards, if it can be made to work at a commercial level, are extremely attractive. One kilogram of fusion fuel would produce the same amount of energy as 10,000,000 kg of fossil fuel.